Are you a struggling Artist who dreams of purchasing frequent spa treatments but realize that when spending approximately $150 per service, it breaks your pockets? Especially if you want to experience those services at least once a week or once a month, as oppose to being treated once a year? Well, here’s an idea! Since ancient times, water has been known world wide to not only cleanse the physical body, but it also heals the soul, especially when dipped into a warm bath. (Think of hot springs) It alleviates pain such as arthritis and menstrual cramps, and strengthens the immune system. It’s no secret that flowers such as Lilly, Jasmine, and Rose are found in various medicines and essential oils to heal physical parts of the body and aid as a mood enhancer. So why not take the actual flower and bathe with it instead of receiving “parts” that have been extracted and transferred into soaps, candles and other aromatherapy products? Did you know that Rose petals contain Vitamins A, C, D and E? Which means that it helps to detox because it’s an inflammatory agent. It also opens up the lungs and reduces asthma. So all you singers out there, take a rose bath! But if you just want to relax and relieve a minor headache, Jasmine Flowers helps with this and also reduces fever. Last but not least, Lilly petals takes away anxiety and depression, and restores balance back to your emotional well being. Treat yourself to something different. We all shower everyday and sometimes bathe, but we rarely ever have the time to do something special for ourselves. 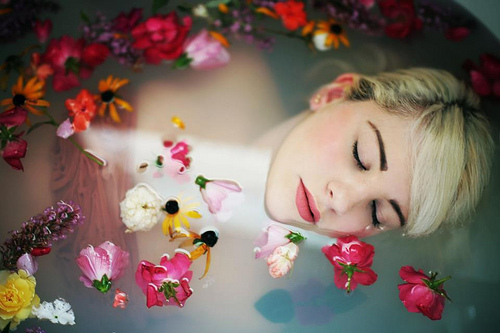 Why not throw some flowers into your tub so you can feel pampered, beautiful and relaxed? Place a small candle beside the tub for a prettier ambiance. 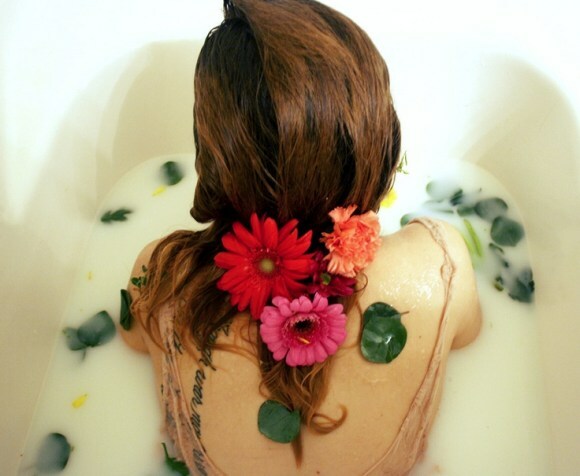 When the going gets tough and you feel like giving up, try taking a flower infused bath. It’s a healthier way of dealing with stress and you can even read a good book or meditate while you’re in there. And remember… we don’t need a harsh reason to suddenly want to pamper ourselves. 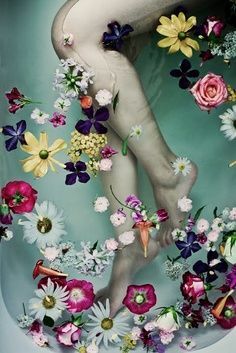 Suppose everything is fine in your life and you’re living on a natural high; you should still try taking a flower infused bath in the comfort of your own home just to maintain your energy level so you can enjoy every minute of your beautiful life. Bare in mind that flowers are from the earth, so there’s something quite mystical about bathing with one of God’s most gentle creations.